I did not know Jamison and Kathryne Pals or their family, though their story came to me through many mutual friends. Their lives were taken, all too tragically, by an accident on an interstate in Nebraska. The Pals family was on their way to Colorado, to prepare to go overseas to serve Japan in Jesus’ name. 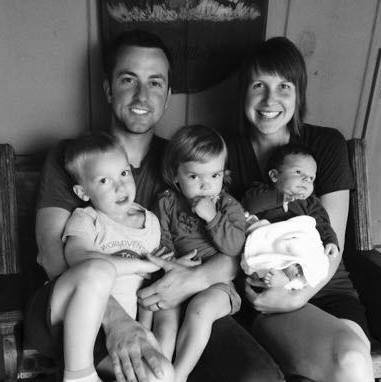 Jamison and Kathryne, with their three children: Ezra, Violet, and Calvin. This tragedy robbed the world of five vibrant lives. And although I never knew them personally, three elements of their story are impacting my life very deeply. 1. They did not hear a heavenly voice. With three kids, the Pals family left for Japan—and it wasn’t because they heard a heavenly voice. Often I lay my life before God like someone waiting on a vision from God. “I’m ready, Lord—just show me the way!” Yet the testimony of the Pals family is this: God is not waiting for you to have a heavenly vision; He is waiting for you to be obedient to the vision He has already given through His Word. The Pals family desired to run in response to the vision of all people knowing Jesus. 2. They were compelled by love. Love that is not expressed can hardly be counted as love. If you love someone, you’ll tell them, and you will tell others, too. Jamison wrote richly about this on his blog about the unreached and why we care. The Pals’ desire for missionary work was not compelled primarily by a specific love for the people of Japan. Don’t hear me wrong—they had a passion and commitment to love the people of Japan. But the source of their desire was a deep and abiding love for Christ. 3. Their lives were not wasted. When we look at the tragedy, we can begin to believe that because they never made it to Japan, their lives had no lasting impact. Yet these five precious lives were far from wasted. We often define success in the Christian life in terms of milestones like, “I became a missionary to Japan.” Yet isn’t it true that God defines our success as obedience in the journey? Our success is not measured by our accomplishments, but by the inclination of our heart for the King of heaven. In the last moment of their life, the Pals physical lives were pointed toward Japan, but their spiritual affections were pointed unwaveringly heavenward. Whether or not the tragedy of Pals family is a waste depends only on our response. How will we react in the face of this tragedy? I, for one, desire a simpler faith. I want a faith that is not so drawn by the lights of a stage but by the burden for the lost. I want a faith marked by simple obedience to God’s Word. I want a faith that longs for Jesus like Jamison and Kathryne, not desiring fame or miracles or approval of people but desiring people to know and love Jesus. Let your heart break over the death of this family. And then let your heart break over your own broken affections. Let the penetrating light of Christ into your life, to overturn rocks and cast light into shadows. Let Jesus be your greatest affection, and follow Him. I never knew the Pals, but I’m certain they would have said the same. Coming alongside you in these thoughts. Well written, Camden. God bless them. My prayers with their family and close friends. One of those things we simply will not understand in this world.